The Market Facilitation Program (MFP) provides partial compensation to farmers and share-rent landowners for losses occurring because of trade disputes. This program is administered by the Farm Service Agency (FSA) and application procedures for MFP are straight-forward. MFP sign-up is a “one-time” event. Applicants should be sure to include all production from all farms, from all counties, and from all states on one MFP application. MFP payments will be an important source of income on many farms in 2018. 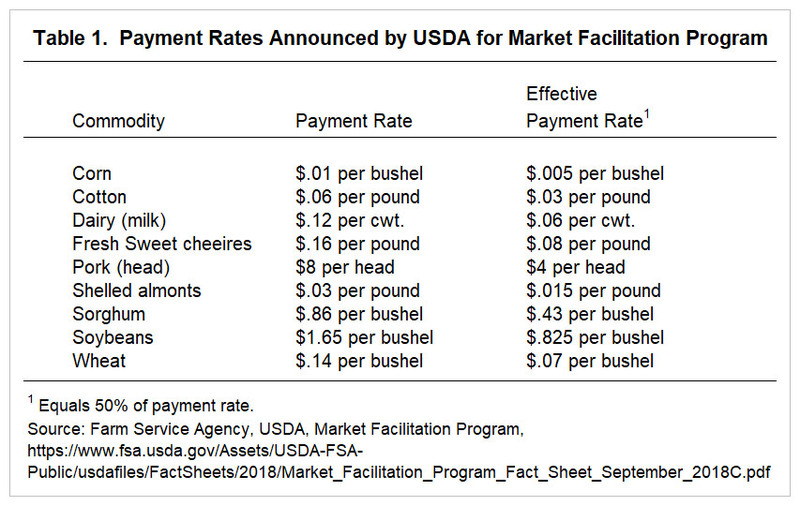 In September, the U.S. Department of Agriculture (USDA) announced the first payment rates under the MFP program for nine commodities based on 2018 production (see Figure 1). A “first” payment to farmers is available on one-half of 2018 production, causing the “effective” payment to be one-half of the rate announced by USDA (see, Farm Service agency, Market Facilitation Program fact sheet). To illustrate, the first payment rate for soybeans is $1.65 per bushel and this $1.65 will be received on one-half of bushels, resulting in a $0.825 per bushel on total production. A farmer with a 64 bushel average yield — the average yield reported by USDA for Illinois (NASS, Crop Production, November 2018) — will receive a first MFP payment of $53 per acre (64 bushels per acre x $.825). Before the midterm election, the USDA strongly suggested that there would be a second round of MFP payments (see AgWeb). Statements from USDA suggest payments similar to that from the first payment. These payments are expected to be announced in the early part of December 2018. The Farm Service Agency (FSA) administers the MFP (see Market Facilitation Program fact sheet for more detail). Applicants have until January 15, 2019 to complete form CCC-910 (see farmer.gov). This form can be completed in person at a local FSA office. Alternatively, the form can be printed out, completed, signed, and then faxed, emailed, or mailed to FSA. Another way of submitting the form is through an authenticated farmer portal. On form CCC-910, the applicant lists the producer’s share of production of each of the nine covered commodities. MFP payments will be made on this reported production amount. If an applicant has an FSA power of attorney and is reporting share rent landowners’ production for MFP, the applicant should be sure to include all of the landowners’ production from all farms in all counties and in all states. When completing CCC-910, the applicant also indicates the source of production evidence. Production evidence is not provided at the time form CCC-910 is signed. However, producers should have evidence prepared when submitting the application as evidence will be required if the application is audited. A convenient form of documentation is crop insurance records if the producer uses crop insurance. Have an average adjusted gross income for the tax years of 2014, 2015, and 2016 of less than $900,000. Be in compliance with highly erodible land and wetland conservation regulations. $125,000 per payment entity for fresh sweet cherries plus almonds. Payment limits may be reached on some farm operations. At an average Illinois yield of 64 bushels per acre, the $125,000 limit would be reached for the first payment on soybeans if a payment entity has 2,358 acres ($125,000 limit / $53 per acre payment). A second payment or payments for other commodities would lower the acreage needed to reach the limit. Many farms will have more than one payment entity involved in a farming operation. The same rules that apply to commodity title program (i.e., ARC and PLC) apply to MFP crop commodities for determining an eligible payment entity. MFP payments come relatively quickly once a production amount is provided for a covered commodity. FSA has made the vast majority of first MFP payments on which production amounts have been supplied. If a second round of MFP payments occur, no further forms will need to be completed. The second round of payments will come relatively quickly after the announcement of second payment rates. Many farmers file income taxes on a cash basis for a calendar year. In these cases, the MFP payment will be taxable in the year that they are received. If production amounts have been supplied to FSA, the first round of payments will have been received and will be taxable in the 2018 calendar year. The second round of payments most likely will be received in 2018 as well. Once production amounts are provided, the applicant has no control over when MFP payments are received. Producers that have not provided production amounts can cause MFP payments to occur in 2019 by waiting to provide production amounts until 2019. Regardless of when MFP payments occur, tax planning should be done for 2018. Even with low prices, 2018 incomes could be relatively high due to high yields and because of MFP payments. Currently, 2019 incomes are projected to be very low (see farmdoc daily, November 13, 2018). MFP payments will have a large impact on 2018 net incomes. Take, for example, a $54 per acre payment on soybean acres. A 1,500 acre farm with a 50-50 corn-soybean rotation would have a payment of $39,750 if all acres had a 100% share. The $39,750 payment would increase net income by the same amount. As noted by Secretary of Agriculture Purdue, this payment will not completely compensate farmers for trade disruptions. The manner in which USDA estimated payments was a partial approach which may not capture all the possible impacts of trades on agricultural Incomes (see Office of Chief Economist, USDA Trade Methodology Report). Moreover, the impacts of tariffs could be long-run in nature, leading to longer-run declines in prices. As a result of tariffs, net incomes on Illinois grain farms are projected lower for 2019 (see farmdoc daily, October 11, 2018). The MFP program will provide income for the 2018 year. This income will be very important if the trade dispute continues and 2019 incomes are much lower. The USDA will announce the levels of the second MFP payment levels in early December. The authors thank the Illinois State Office of the Farm Service Agency for providing information useful in the preparation of this article. Schnitkey, G. and K. Swanson. “Financial and Risk Management Decisions for 2019.” farmdoc daily (8):209, Department of Agricultural and Consumer Economics, University of Illinois at Urbana-Champaign, November 13, 2018. Swanson, K., G. Schnitkey and J. Coppess. “Reviewing Prices and Market Facilitation Payments.” farmdoc daily (8):188, Department of Agricultural and Consumer Economics, University of Illinois at Urbana-Champaign, October 11, 2018.